There is only one thing more satisfying than making a hole in one: making a hole in one and walking away with $1,000,000! Present one of your participants with the opportunity to win the ultimate prize by running a shootout contest at your next golf event. Just hold a qualifying contest (closest to the pin, raffle, etc.) to choose who the lucky contestant will be and then gather round to watch the excitement unfold. Grand prizes ranging from $100,000 to $1,000,000 can be covered. · "A" Rated Prize Protection - US Hole In One is Backed by the Best! · 110% Low-Price Guarantee - All Legitimate Quotes Will Be Beaten! Using the price quote and purchase link provided by US hole-in-one insurance, complete the 7-section online application that was emailed to you with your hole-in-one insurance estimate. The purchase link can be found in the first paragraph of the body of the email. Once you open the link, you can view, edit and purchase the policy through the online application. On the day of your event, place the signs out on the course. If a golfer successfully makes a hole in one, notify us within 24 hours, and we will promptly award the appropriate prize to the winner. All pricing based on three factors: # of attempts, payout timeframe, and grand prize value. 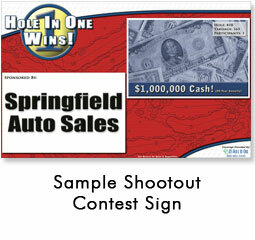 All prices include grand prize coverage, signage, and sign stakes. All players must be amateurs according to USGA rules and regulations and playing on 165+ yard hole. Witness requirements may apply. Prices subject to change. Customer Service | Client List | FAQ/Help | Resources | Archived Blog | Articles | Sitemap | Copyright ï¿½ US Hole In One. All rights reserved.